Why Is The Pope’s Mitre Shaped Like A Fish? Did you ever wonder why the Pope’s mitre looks like the head of a fish? What are the origins of this ceremonial hat and what does it truly represent? 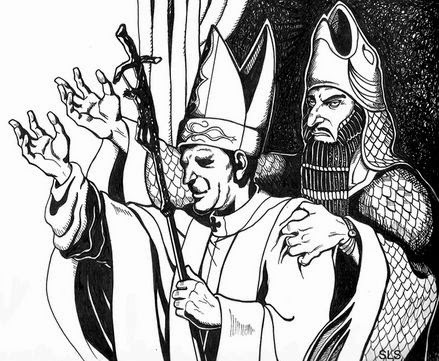 Dagon, the fish-god of the Philistines and Babylonians, wore a fish hat that is still seen today with Roman Catholic Church‘s pope and bishops. What the church’s explanation fails to describe is the actual fish eye on the side of the mitre. Perhaps this is an ember of charcoal from the tongues of fire? Probably not, it’s a fish eye. Ea / Enki, who is a God of Sumerian (Enki) and Babylonian (Ea) mythology. In Babylonian mythology, Ea was a water god who was half man, half fish hybrid. In Greek mythology, Ea was known as Oannes. 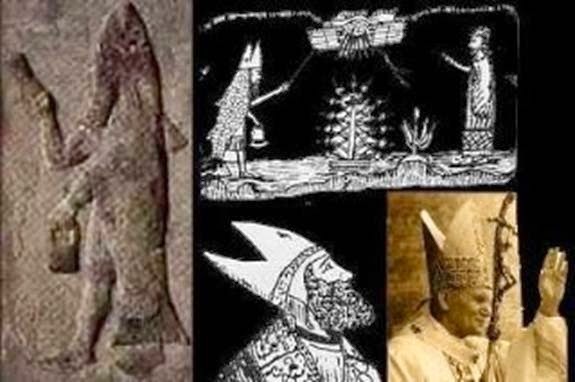 By any name, this fish-god can be traced back to the genetic manipulation of man by the Anunnaki, as evidenced by Zecharia Sitchin’s work. It is believed that, in the daytime, this deity would emerge from the water and was responsible for teaching art, science and writing to the human race. “At first they led a somewhat wretched existence and lived without rule after the manner of beasts. But, in the first year after the flood appeared an animal endowed with human reason, named Oannes, who rose from out of the Erythian Sea, at the point where it borders Babylonia. “He had the whole body of a fish, but above his fish’s head he had another head which was that of a man, and human feet emerged from beneath his fish’s tail. He had a human voice, and an image of him is preserved unto this day. He passed the day in the midst of men without taking food; he taught them the use of letters, sciences and arts of all kinds. “He taught them to construct cities, to found temples, to compile laws, and explained to them the principles of geometrical knowledge. He made them distinguish the seeds of the earth, and showed them how to collect the fruits; in short he instructed them in everything which could tend to soften human manners and humanize their laws. 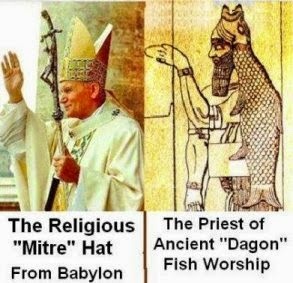 “The chief priests wore miters shaped like the head of fish, in honor of Dagon, the fish-god, the lord of life – another form of the Tammuz mystery, as developed among Israel’s old enemies, the Philistines. 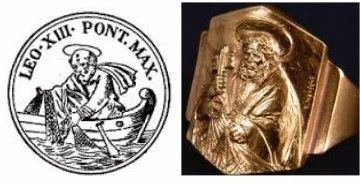 When the chief priest was established in Rome, he took the title Pontifex Maximus, which was imprinted on his miter. “When Julius Caesar (who like all young Roman of good family, was an initiate) had become the head of State, he was elected Pontifex Maximus, and this title was held henceforth by all of the Roman emperors down to Constantine the Great, who was, at one and the same time, head of the church and high priest of the heathen! Did you ever wonder why people kiss the Pope’s ring? Why do so many people of prominence kiss the Pope’s ring? The Ring of the Fisherman, also known as the Piscatory Ring, is an official part of the regalia worn by the Pope, who is head of the Catholic Church and successor of Saint Peter, who was a fisherman by trade. It used to feature a bas-relief of Peter fishing from a boat, a symbolism derived from the tradition that the apostles were “fishers of men” (Mark 1:17). Although Pope Benedict XVI wore his Fisherman’s Ring daily, it is no longer the custom for popes to wear it at all. Generally, a new pope will either inherit the daily-wear ring of his predecessor, keep an old ring of his own preference, or will choose a new daily-wear style. Why is it no longer custom for the pope to wear this ring? Because in astrotheology, we are existing out of the Age of Pisces (the two fish) and into the Age of Aquarius. The ring no longer symbolizes the Age of Pisces. Instead of seeing the two fish on people’s bumper stickers, we will soon start seeing some sort of sign for the water bearer, Aquarius. 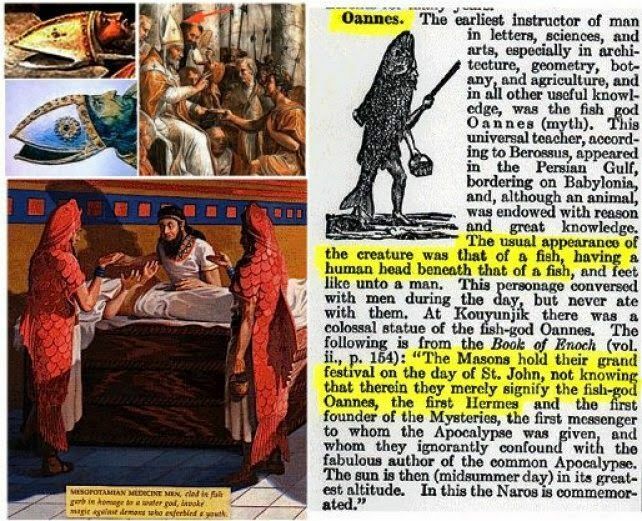 Many consider the Canaanites to be part of the Philistines who worshipped worshiped Baal, Astarte and Dagon. These were some of the early sun-worshipping cultures that have led to many of the metaphors we see in modern religion, e.g. God’s son/sun. 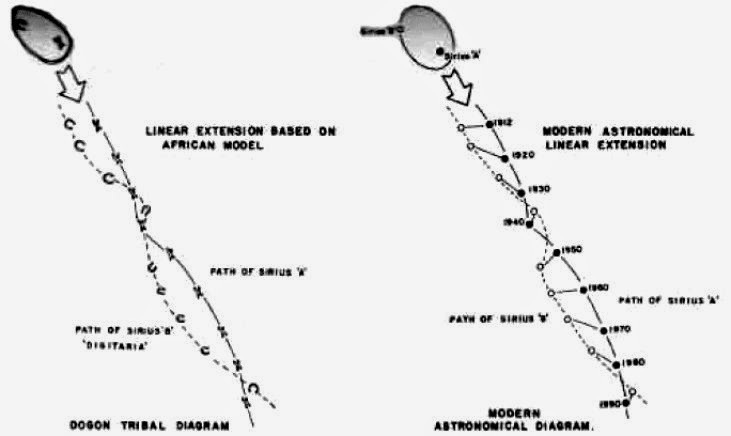 According to Dogon legend, the Nommos arrived from the Sirius star system in a vessel along with fire and thunder, or as we would say today, in a UFO. The Nommos were part fish and part man and could live on both land and in the sea. They are also referred to as “Masters of the Water”, “the Monitors”, and “the Teachers”. Perhaps frogs, dolphins and whales were placed here by the Nommos? Even the mystery of mermaids may originate from this premise. Why do we see fish fries on Friday? Did you ever wonder why practicing Catholics abstain from eating fish on all days except Friday? 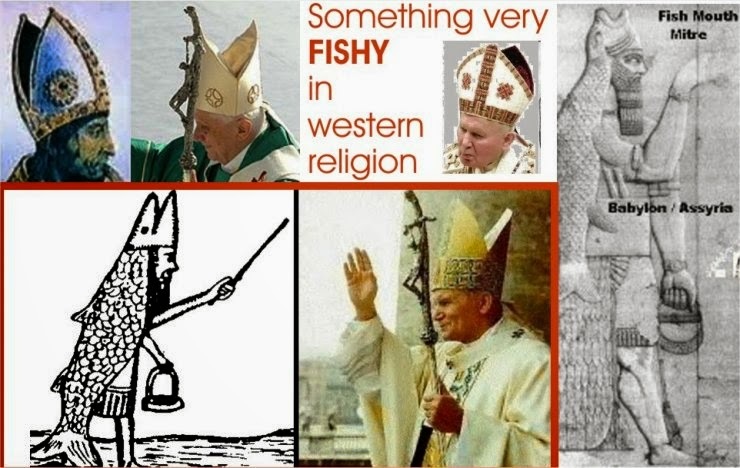 As for the pope’s miter, it’s a fish hat and its origin is tied into mythology, ufology, paganism and sun worshiping.